I got all of this for $5!!!! I was super excited to go fabric shopping with Mena while I was in San Francisco. If you follow Mena's blog, you know she always finds super amazing fabric (often vintage) and sewing notion deals. Our first stop (and the source of all the booty above) was Scrap. Scrap is an AMAZING space. It's in an old warehouse building and doesn't look like much from the outside but you walk in and lo-and-behold it is a crafter's haven! There are literally bins of zippers for 5 cents, two large filing cabinets full of patterns for a quarter, row upon row of fabric scraps and a whole aisle of buttons and notions!! I got loads of buttons, fabrics, zippers, lace, corded piping, belt buckles and a few patterns! Mena was really good at spotting the fabulous fabrics like the two colourful prints above (about 1.5 yards and 2 yards each). I highly recommend visiting scraps if you are ever in the bay area. It is amazing. I wish we had something like that in Scotland!! 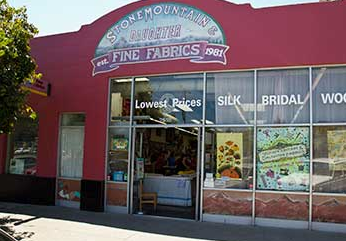 Next up on the shopping tour was Stonemountain and Daughter fabric store. I remembered reading about this fabric store on Mena's blog and it was lovely to visit them. They have a great range of reproduction cotton prints, a lovely collection of wool crepes and tons of colour cottons. I credit Mena with finding this lovely fabric! I walked away with 4.5 yards enough for a dress or separates and a dress. I am planning to make something from it for our upcoming picnic in New York City at the end of the month! Isn't it lovely?? Stay tuned tomorrow for more of my fabric shopping adventures! It was so much fun to hang out with Mena and to go to some of her favourite places! Fantastic finds! And that red floral is gorgeous! Great finds. I wish there was a place in the U.S like scraps. Wow. Nice to see that San Francisco still has places like that. Both look really cool. I'll bet there's something like it in Portland. Im decided. Sao Frascisco is now an official contender for holidays. WOW! No WONDER Mena has such thrifty haberdash and things! Well done Debi! What a store wish I knew it was there when I lived in CA. Can't wait to see with what you do with your finds. Can't wait to see the finished products, especially the orange, that's beautiful! Glad you had such a good time and found lots of things! I buy tons of fabric at Stone Mountain which is my local (and independently owned - hurrah!) fabric store. They always have a great selection, and the salespeople are very knowledgeable. Glad you enjoyed your time here in the SF Bay area. $5 for all that?! We NEED a Scrap in the UK! OMG, $5!!!! That is unbelieveable!!!! @David, there IS a place like this in Portland, and it's called....SCRAP. It's over in Northeast. Oh wow! What great bargains. I love the heart shaped buckle. We have a Scrapstore in Selkirk. It is like a wee Aladdin's Cave - fab! I really hate that there are no places like this in the Netherlands! Both of your posts make it look so fun! Can't wait to see what you do with that fabulous orange print! 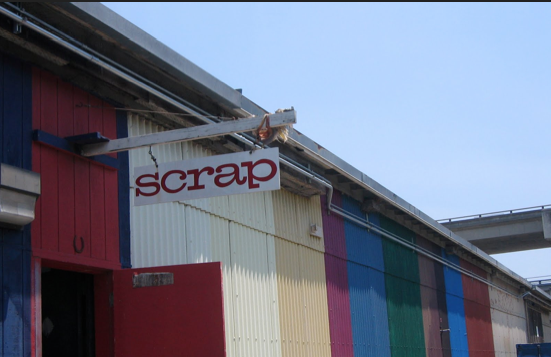 I think scrap looks pretty amazing from the outside, too...hehe! I wish we had something like that here, and in fact it's kind of a dream of mine to be involved in such an organization. Nice haul!!! Oh no--Scrap is closed? I just came across your post because I'm visiting San Francisco soon and saw you mentioned shopping there... their website looks like it's still active?